Keller was born in the German town of Guben in 1981. This town is special: there is a German Guben and a Polish Gubin, facing each other across the German-Polish border. And it is this situation that formed the basis of her European political engagement. “For a long time, the border was closed. And even after the fall of the Berlin wall, you still had to present your passport and your car could be searched. Only when Poland entered Schengen did the border become more permeable,” she recalled. “As it is now, German and Poles are getting closer as they go along with their activities. They go to swimming pools, attend cultural events, go shopping, as if there was no border. In fact, they are overcoming the border,” she observed. There is another way in which Guben forged her political engagement. “As I grew up, there was neo-nazi violence and I started to organise demonstrations in my hometown,” she said. “This is when I started getting politically engaged, I was in my early teens,” she added. Her involvement with the Greens was almost accidental. “Living in a mid-town as I was, I only knew the Green party from the television. Then, one day, I attended a seminar and it turned out that all the participants were members of the German Green party. And I agreed with everything they said,” she recalled. After this encounter, she said, it did not take her long to join the Greens, in 2002. “It was when I moved to Berlin for my studies that I started to get politically active. I eventually joined the Federal board of the young Greens in Berlin,” she said. Ska Keller said the thing she really likes about the Green party is its homogeneity. “There was this really fantastic, fascinating moment I recall, an event with the European Greens. No matter where the participants came from, there was no major dispute. This shows that no matter where you come from, the fundamental values within the Green party are the same and I really like that,” she stressed. She said she is still going back to Guben regularly to visit the local Greens group, “which is growing”. Keller was elected to the European Parliament for the first time in 2009, at the age of 27. In May 2014, she was the European Greens’ frontrunner at the last European elections. 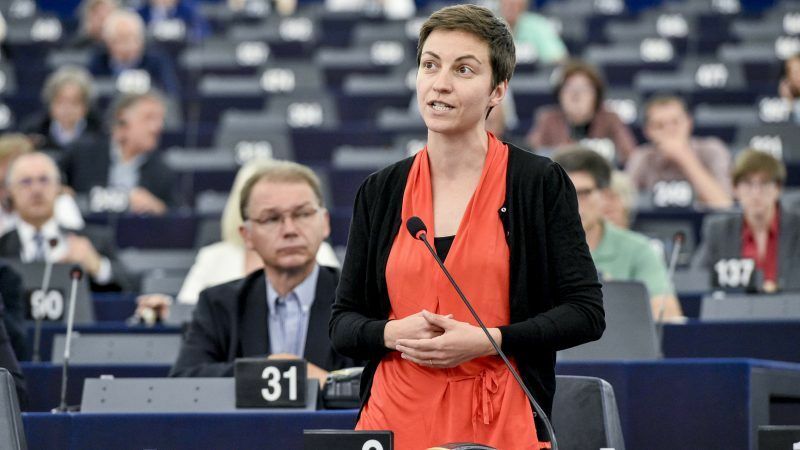 In her second term as an MEP, she has been a member of the Committee on Civil Liberties, Justice and Home Affairs (LIBE) and the president and migration policy spokesperson for the Greens/EFA group in the European Parliament. As a candidate for the European Greens, she would like to bring a two-level discussion: pro-European and pro-change. “Being pro-European means to fight tooth and nail against the attacks of the far-right, and also against the Conservatives if you take into consideration that Viktor Orban is part of the EPP,” she said. “We really have a problem here. The whole appeal of the EU is now under attack,” she warned. “Pro-change means that Europe should be changed according to three pillars: ecological, social and democratic,” she said. Regarding the ecological dimension, climate tops the agenda. “We are the last generation that can do something about global warming and people are ready for that, it is just a question of political will now,” she stressed. On a social level, the MEP calls for minimum social standards for citizens, adapted to the country they live in. “Obviously, a minimum wage will not have the same level in Sweden as in Romania, but the principle remains the same,” she said, adding that a minimum social standard could also be applied to medical healthcare. As far as democracy is concerned, Keller underlined that fundamental European values such as the independent judiciary, the freedom of the press and the rule of law are now under threat in Poland, Hungary and Romania. “European institutions should defend the rights of the citizens of these countries as well as all the rights of all European citizens. And the European Commission must trigger the rule of law framework,” she said.